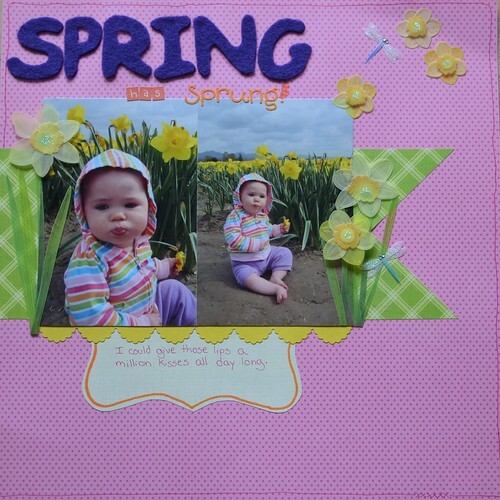 It seems like it has been forever since I've scrapbooked. It has been hard to find the energy and that is mostly because there is a little being growing in my belly. That's right, Moose is having a little brother come July! 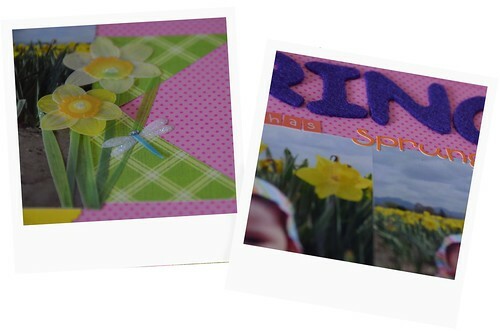 So I had a little bit of energy and came across a new scrapbooking challenge blog and decided to give it a go. They had a layout challenge and I'm looking for new layouts to try. Of course, I wandered a little bit away from the layout, but mostly because I only had two photos instead of the three the layout called for. I have had the daffodil stickers for years and was glad I could finally get to use them. I also cut out some felt letters and used them for my title along with some stickers. The best part was I was able to make this page fairly quickly, as in one day. Usually it takes a few days, but Moose took a rare long nap today, so I was actually able to get it all done. Your layout is so cute!! I love how you changed up the sketch for 2 photos instead of 3! Isn't it fun to just get the glue back out :-)One minute they are in our belly and the next it's their 21st birthday party. Those daffodils are so cute and perfect for the pictures. Thanks for sharing. I love the wonderful "spring" colors you used on this layout. I'm glad you were inspired by our sketch and thanks for linking up to Paper Lovers Studio!